PT 31 XT consumables suitable for use with the PT 31 XT torch, which is used on many Chinese plasma cutters. These parts are excellent quality and are manufactured to extremely fine tolerances - the shrouds and swirl rings are manufactured from solid-state sintered, fully stabilised, Zirconia-Yttria ceramic. The nozzles are pressed copper and the electrodes are turned copper, with hafnium cores. 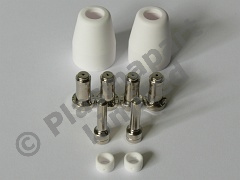 This pack is supplied as shown, and contains 4 nozzles, 2 electrodes, 2 swirl rings & 2 Shrouds.